1. Screw l/d ratio: 24 : 1. 2. 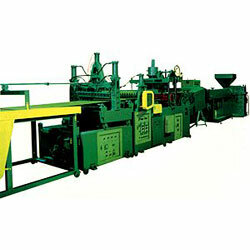 Extruding caracity: 100-120 Kgs / Hr. 3. Driving motor: 60 HP V.S. 1. Heatter capacity: 32 KW. 2. Temperature control panel: 10 zones. 3. Heater capacity: 40 KW. 4. Take-off motor: 3 HP. 5. Conveyor motor: 1/2HP. 6. Machine weight (approx): 10,000 KGS. 7. Dimensions(approx)mm: 16000 x 2300 x 2200.